Many of California’s ecosystems rely on fires to create a patchwork for differing vegetation types. Long before humans permanently resided in California, lightning and volcanic activity started fires; and after that; Native Americans, “regularly burned the vegetation to open up an area and to favor plants that attract game animals.” (fireca) Chaparral ecosystems (biomes consisting of rocky hills and mountain slopes) that exist in central and southern California are examples of areas where plants are well-adapted to fire. However, fires have become more severe, and have encroached on housing (where humans have settled) recently. A combination of dry heat, droughts, and the expanses of land that rely on regular wildfires to regenerate, create the right conditions for destructive fires. By looking at the map, it is evident that 2018 has been the worst year for Californians living in chaparral ecosystems. 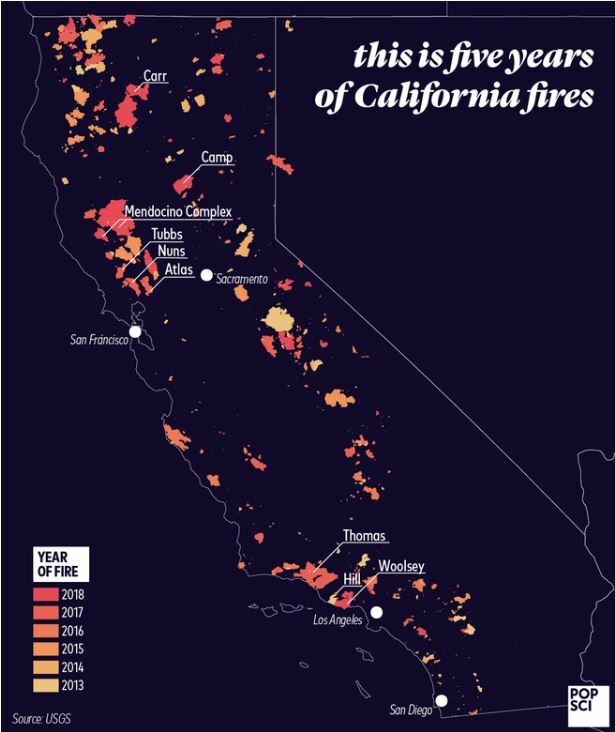 However, other years were more destructive in terms of fires that occurred naturally, but that is not readily depicted in this map. If the total acreage of burned land from 2013 through 2018 is added up, that would equal 5,395,088 acres. California has a total land area of about 100 million acres, which means that over the past five years, roughly 5.4 percent of the state has been burned in fires. Although this is a relatively low percentage, the issue is not necessarily an issue of size but rather location. As the map shows, the same areas are repeatedly affected by wildfires on a yearly basis. Unfortunately, because these areas are also highly residential, the fires have caused billions of dollars in damage to properties. The latest estimates of insured losses from California wildfires ranges from $9 to $13 billion. Maps like these help to visualize where problem areas are for Californians and can help with better planning for housing and relief efforts. Firefighters from around the state fled to different geographic areas, and this map can help those fighters to better position themselves to come to aid when subduing these fires.